Been reading a lot on balls, fittings, shafts helping shape your game but what about the trinkets? Is there anything out there you feel is a great training tool? There’s some interesting stuff on the market. Curious if there is anything anyone has used and thinks it’s a must have? All I have is a few alignment sticks. I use the Orange Whip trainer. It really helps with tempo, stretching, and swinging on plane. I have a whip warmer upper, but two new things I’ve been using are the putting alignment mirror and the accustrike carpet tool. Both pretty handy. Go to Lowes or Home Depot and buy driveway markers to use as alignment sticks. They're like $.99 instead of paying $20 for "golf alignment sticks"
I have a putting alignment mirror that also has a path on it. I use it before every tournament round. I'm a sucker for videos on training equipment. It all looks like it works so good. This was one of the items I thought about getting the most. It seems almost perfect for getting a good putting stroke. I even liked the idea of the shirt with the single sleeve that you wear to keep your arms in tight but no way I'd wear that on the driving range....no way. I found one of the yellow bar swing aides you attach to you club in my gadget bag. I must've bought it on a whim years ago. I can't figure out the wrist action on it very well. One of those that looks so cool on the videos then I never use it. 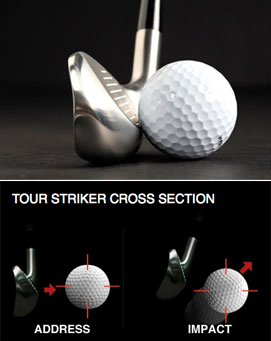 If you buy the Tour Striker, buy the wedge, don't buy the 7-iron. Unless you love spending money. This. And actually using them not just as headcover holders. They are the swiss army knife of training aids. 000s of different uses. ETA: tempomaster; 2nd best training aid. All the stuff Kevin Costner had on in Tin Cup.